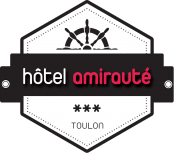 The Hotel Amirauté is ideally situated in the heart of Toulon, close to the Place de la Liberté and tree-filled parks that have children’s play areas. It’s just a few minutes from the SNCF railway station, the bus station and the port, and within easy reach of several cinemas and numerous bars, restaurants and shops. The Mayol shopping mall, the typically Provençal Cours Lafayette market, the shops of the town centre and those of the pedestrian precinct are all within walking distance. Most local institutions are also in the immediate vicinity. Make the most of your stay at the Hotel Amirauté by exploring Toulon and the many sights and activities situated close to the hotel. Beach days, cruises, island excursions, family outings and more; you can choose from a wide range of activities easily accessible from the hotel. It only takes a few minutes by bus to reach the famous beaches of Mourillon and only a 5 minute walk to reach the port, where you can catch a boat to the beaches of Sablettes. This 2 options are available at the hotel Amiraute's front desk, after you park your car. - price 2 days 18€ 3 days 26€ (+ 8 euros per extra day) available maximun for 10 days. Underground parking monitored 24/7 by cameras and security personnel. Go down the Avenue Vauban and turn left at the traffic lights (after the Franprix). Take the 2nd right (just after the Hotel des Arts) (Rue Guiol). At the end of the motorway, stay in the right-hand lane in the direction of Toulon Centre. At the first set of traffic lights (at the Carrefour Market supermarket), take the middle lane towards Centre Ville (town centre). At the 4th set of traffic lights, head in the direction signposted Centre Ville. At the 6th set of traffic lights, take the middle road in the direction signposted Centre Ville. Go up the Boulevard de Strasbourg and stay in the right-hand lane. The Place de la Liberté is on your right after the 10th set of traffic lights. At the 12th set of traffic lights, turn right in the direction of Gare SNCF (Avenue Vauban). Turn right at the 2nd street (Rue Peiresc) and continue straight around the Place de la Liberté. At the corner of the Place de la Liberté, turn right (Rue de Chabannes) to the red light (Quick on the left). Cross the Boulevard de Strasbourg and head down the Rue Pastoureau. Turn right at the first street you come to. Continue straight ahead, before turning at the first right (Rue Guiol). At the traffic light at the end of the autoroute as you enter Toulon, stay in the middle lane. Follow the direction signposted Centre Ville, then head in the direction of Centre Ville - Palais de Justice. Pass between the Palace of Justice (on the right) and the Jardin Alexandre 1er (on the left). Once on the Boulevard Maréchal Leclerc, stay in the right-hand lane. Pass the Chamber of Commerce (on the right). The hotel is in the 2nd street on the right after the Chamber of Commerce (it is prohibited to turn into this street from this direction). Continue to the traffic lights at the corner of Galeries Lafayette and turn right. Go down the Rue Pastoureau and turn right at the first street. Continue straight on and turn right at the 1st street (Rue Guiol).